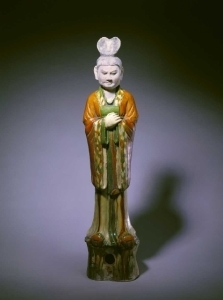 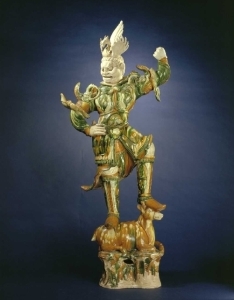 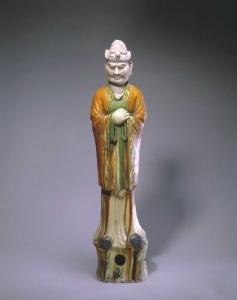 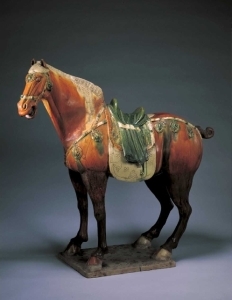 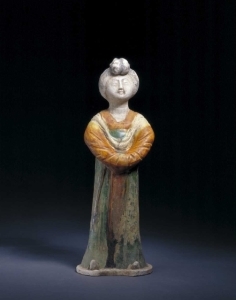 The Tang Dynasty (618-907) is famous for its energetically modeled and brightly colored tomb figurines. 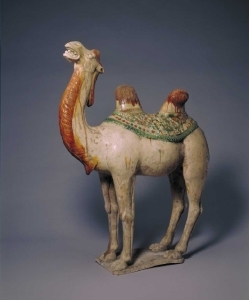 Made from low-fired earthenware and intended exclusively for burial, these charming horses, camels, and civil officials have become immensely popular. 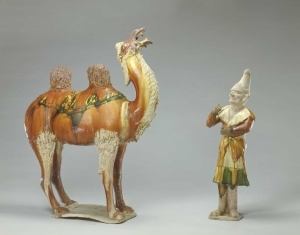 In their own day, however, they were neither in the forefront of ceramic technology nor highly regarded by collectors or connoisseurs. 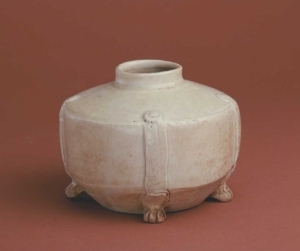 Three northern kilns were responsible for producing the majority of lead-glazed Sancai (三彩) or “three-colored” ware that furnished the tombs of the aristocracy for more than one hundred and fifty years of the Tang Dynasty. 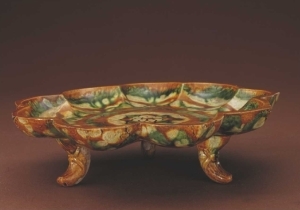 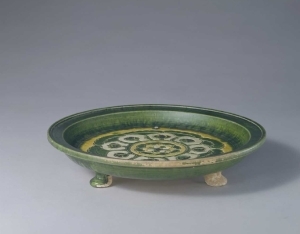 Developed during the seventh century, the new colors were achieved simply by mixing metal oxides to a lead fluxed glaze. 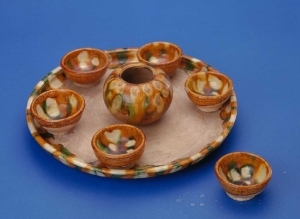 The oxides included copper for green and iron for amber or brownish yellow. 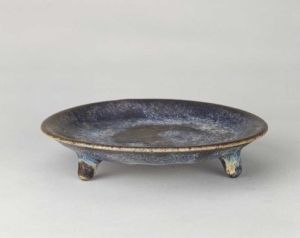 Together with a clear, cream glaze, they provided the three basic colors but, on rare occasion, expensive cobalt oxide for blue was added to the mix. 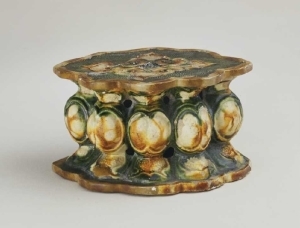 The tendency of the glaze to run slightly accounts for the splashed effects and mingling of the colors that give Sancai their exuberant effect. 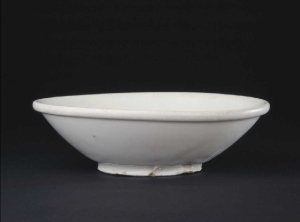 It is assumed that three-color ware was reserved for burial ware and was seldom, if ever, used in daily life. 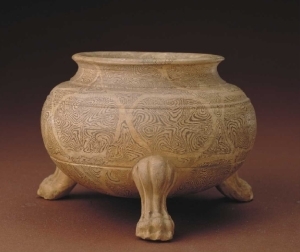 Sancai traveled along the Silk Road, and was later extensively used in Syrian, Cypriot, and then Italian pottery from the 13th to the middle of the 15th century. 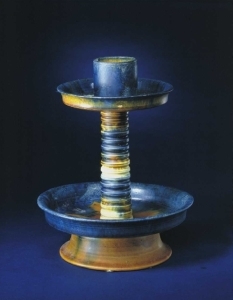 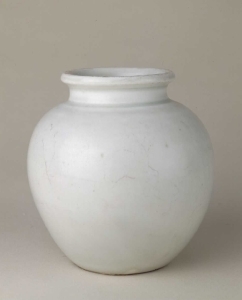 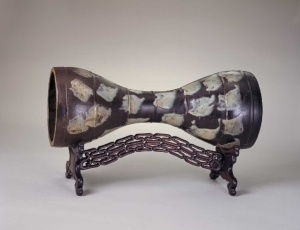 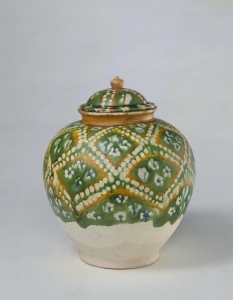 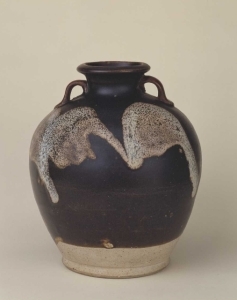 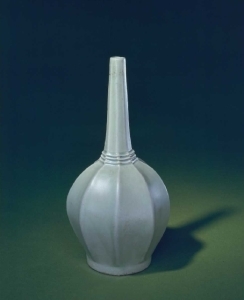 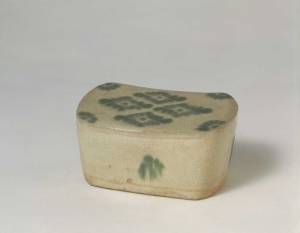 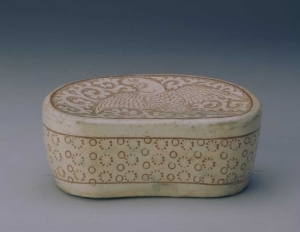 Sancai also became a popular style in Japanese and other East Asian ceramic arts. 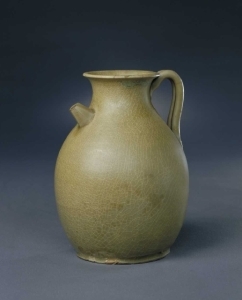 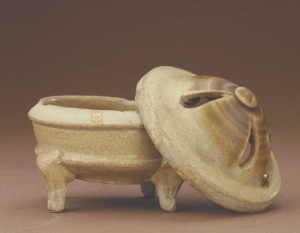 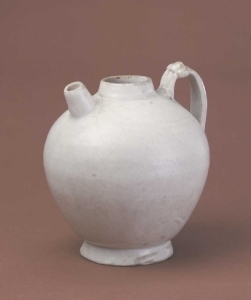 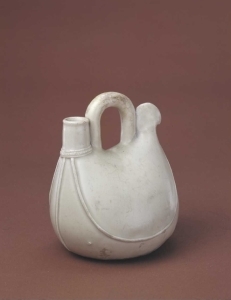 However, it was in the making of functional ceramics for daily use and export that Tang potters achieved their greatest technical innovations and artistic refinements. 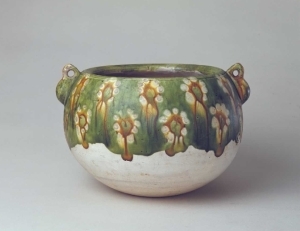 They invented underglaze painted décor, phosphatic glazes, perfected high-fired celadon, and experimented with cobalt blue glazes. 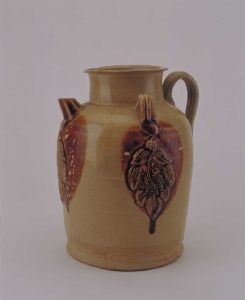 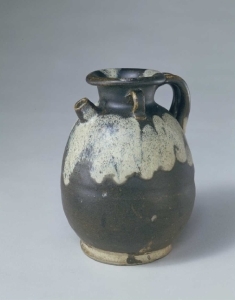 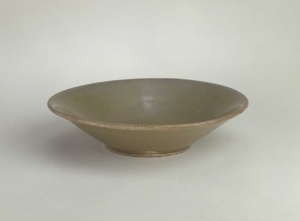 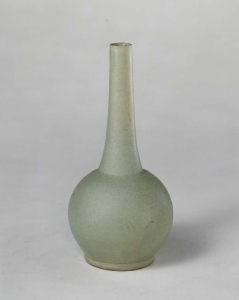 Their interest in single color wares, especially white ware, brown ware, celadon, and cobalt blue laid the groundwork for Song (960-1279) taste in monochrome glazes, refined ceramic shapes, and splashed brown and black wares.